Eve knew the stories of the Fall, of a time before she wandered into the colony of Eden, unable to recall anything but her name. She's seen the aftermath of the technology that infused human DNA with cybernetic matter, able to grow new organs and limbs, how it evolved out of control. The machine took over and the soul vanished. A world quickly losing its humanity isn't just a story to her though. At eighteen, this world is Eve's reality. Picking up Eden was a little unexpected for me. I was in the middle of reading another book, but when I stumbled across this one and randomly began to read the first page, I was sucked in and forced to finish the entire novel. Everything about the book entranced me- the cover, the premise, and the characters. I am thrilled to say that I have found yet another original, captivating dysptopian story. 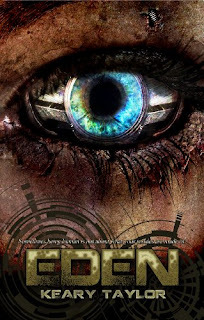 The world as we know it has ceased to exist, leaving only a handful of survivors struggling to maintain their tiny society of Eden while hiding from their cybernetic enemies. While this novel does have many new elements, the plot is also reminiscent of post-apocalyptic books such as the Uglies series, The Hunger Games, and others. Personally, I was glad to find another extension of this type of story. Eve is a very unique character. Toughened by her rough lifestyle and nearly unemotional since she can remember, Eve is one of Eden’s best fighters and leaders. I admired her extreme strength of mind and heart. Still, sometimes her blunt outlook on life and stubbornness rubbed me the wrong way. After a while, I learned to accept it as a part of her harsh personality. The romantic aspect of the novel was probably my favorite part. Avian is Eve’s rock and the closest friend she’s ever had. He knows her like no one else does and accepts her, faults and all. West, however, awakens something inside of Eve. He turns her life upside down and makes her feels things she didn’t know she could. I don’t want to give too much away, but in the end I was extremely pleased with Eve’s choice. Overall, I would definitely recommend Eden to anyone who is searching for a futuristic tale full of drama, romance, action, and emotion. I can’t tell you how glad I am that I happened upon this incredible book! Glad to hear this one was so good! I just recently picked it up for my Nook, it looks pretty amazing!